There were 672 press releases posted in the last 24 hours and 154,027 in the last 365 days. n'cloud.swiss is paving its way towards international expansion and establishment as the "Swiss made" alternative to Amazon AWS, Microsoft Azure & Co.
SEENGEN, AARGAU, SWITZERLAND, July 8, 2018 /EINPresswire.com/ -- Considered as the digitization tool par excellence, the cloud’s capabilities are only now beginning to be realized. Cloud computing is thereby the promise of having a modern and state-of-the-art IT infrastructure without the need for substantial capital investments and personnel increases. It is not surprising that the cloud market revenue is expected to double in the next three years reaching up to 162 billion USD. More than 65% of the cloud computing market is occupied by only a few leading giant providers such as Amazon AWS, Microsoft Azure and Google Cloud. The remaining 35% market share is in the hands of thousands of cloud providers scattered around the world. The question arises as to after which criteria customers decide for a cloud provider. The answer is: They do not decide for one. Many companies pursue a multi cloud strategy to maintain the ability and flexibility to select different cloud services from different providers. In fact, cloud computing is distinguished by a set of deployment models which are private, public and hybrid. Today, there is no single multi-cloud infrastructure vendor with the exception of n’cloud.swiss. Praised as a “Swiss made” alternative to the major cloud providers, the idea behind n’cloud.swiss is to enable customers to design a cloud according to their specific requirements with the same product, either as a service model, an on-prem version in existing IT environments or as a hybrid variant. In addition, all cloud service models from Infrastructure as a Service (IaaS), over Platform as a Service (PaaS) to Software as a Service (SaaS) are part of the platform. All this is surrounded by an innovative internal n’cloud.swiss application catalogue. Within the latter, n’cloud.swiss offers more than 142 applications from 30 different IT categories “free and ready to go” as well as the opportunity to upload also other development applications and tools easily. Along personal support and competitive pricing models, API connectivity for easy and fast transfers of existing developments from or to other major cloud platforms award n’cloud.swiss a unique selling point and a competitive advantage. In the pursuit of driving the adoption of blockchain-based services in government, Luxoft is striving to establish a blockchain for government alliance and hence promote blockchain use-cases in public institutions. As Europe’s leading supporter of blockchain, Zug already accepts cryptocurrency for services and has digitized ID registrations built on the blockchain. With Luxoft’s e-voting platform, a safe and secure move towards online voting is now made possible. With the help from the Lucerne University of Applied Sciences and Arts, Amazon AWS and n’cloud.swiss, the platform is deployed on three different data centers in the cloud. Two of these are in Switzerland and one in Ireland. By distributing the data into three different data centers, security and data loss risks are distributed geographically, making the system more robust. While Amazon AWS is worldwide recognized as the undisputed leader in the cloud computing world, n’cloud.swiss is paving its way towards the establishment as the “Swiss made” alternative to major cloud providers. n’cloud.swiss AG is an international operating and highly qualified service provider in the areas of IT and cloud solutions and is one of the leading providers in various markets. The owner-managed IT company was founded in 2001. Since then, it has been one of the very few companies in the cloud sector worldwide that can tailor all cloud models and services from Public, On-PREM or Hybrid clouds as well as offering “managed”, “semi-managed” or “unmanaged” support services. n’cloud.swiss AG also supports partners with its n’world innovation center in the implementation of new IT and cloud technologies with exciting projects for numerous business fields and use cases. These include, for example, blockchain projects, machine learning, edge computing, AI, big data, etc. Safety through quality — quality through specialization and innovation. For n’cloud.swiss AG, these are not just goals, but lived values. For effective protection and the highest level of safety and innovation for our current and future customers at home and abroad. 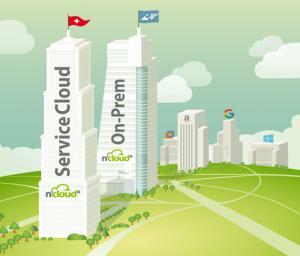 n'cloud.swiss - "Swiss made" alternative to Amazon AWS, Microsoft Azure & Co.